Yet critical reaction to them can also be contrary, and sometimes wilfully ignorant. 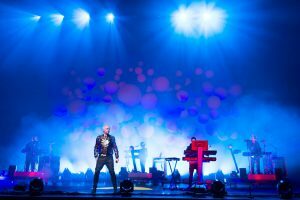 Quite apart from releasing some of the greatest pop singles of the past 20 years, PSB have also made at least three classic albums, with Fundamental now making it four. Detractors dwell on their apparent archness or snag on the perceived contradiction between their innate melancholia and giddy, hi-NRG hedonism. This misses, surely, PSBs uniqueness, which is that they locate the sadness that always resides somewhere in silliness, and vice versa. Fundamentals political content is coming under scrutiny. Their current single, Im with Stupid, addresses the relationship between Bush and Blair, and the track Indefinite Leave to Remain uses a phrase from current political terminology and fashions from it a song that is about ID cards and asylum-seekers, and is also a love story. Very PSB, again. But theyre wary of being labelled too narrowly. Weve just been doing these European interviews, sighs Tennant, and theyve all been saying, So, this is your most political album, I think? But we did actually write a little manifesto at the beginning of the album. We wanted the songs to be about fear and… He turns to Lowe. What was the other one on the list? Ive forgotten, he replies. You cant expect me to remember things. Authoritarianism, says Tennant. He can  well, in fact, he does  go on like this for hours, tying himself in knots, highbrow and lowbrow, sacred and profane fighting for airspace in his busy brain. Periodically, Lowe rouses himself from the sofa. Weve returned to arch again, arguing about whether its an adjective or an adverb. We used to parse at school, Lowe says suddenly. Youd go through every word in a sentence and say what it was. Thats the most animated hes been in the interview, shrieks Tennant. Its 20 years since West End Girls was first a hit: the beginning of a career that has encompassed working with Dusty Springfield, scoring Battleship Potemkin and performing it in Trafalgar Square, having a Christmas No1 with Always on My Mind, writing a musical and coming up with Being Boring, arguably the sweetest and saddest dance single of all time. Those of us who proclaim their genius from the rooftops should probably chill a little. Its as if, after all this time, Pet Shop Boys  with or without the definite article  are realising what theyve accomplished. Releasing a new album thats up there with their best joins a long list of achievements. Im sick of lists, says Tennant. What, all of them?